Enjoy it, and help to fill it! But please, always respecting copyright, you must not fill in this manual with information of official Compiere manual. Help : The Business Partner Tab defines any Entity with whom an organization transacts. Credit Status Business Partner Credit Status Credit Management is inactive if Credit Status is No Credit Check, Credit Stop or if the Credit Limit is 0. If active, the status is set automatically set to Credit Hold, if the Total Open Balance (including Vendor activities) is higher then the Credit Limit. It is set to Credit Watch, if above 90% of the Credit Limit and Credit OK otherwise. Open Balance Total Open Balance Amount in primary Accounting Currency The Total Open Balance Amount is the calculated open item amount for Customer and Vendor activity. If the Balance is below zero, we owe the Business Partner. 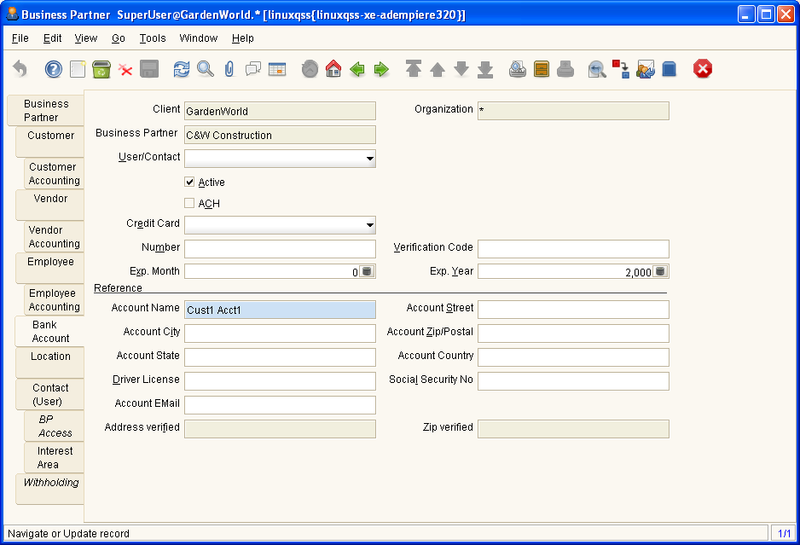 The amout is used for Credit Management. Invoices and Payment Allocations determine the Open Balance (i.e. not Orders or Payments). Link Organization Link Business Partner to an Organization If the Business Partner is another Organization, select the Organization or set to empty to create a new Organization. You link a Business Partner to an Organization to create explicit Documents for Inter-Org transaction. If you create a new Organization, you may supply a Organization Type. 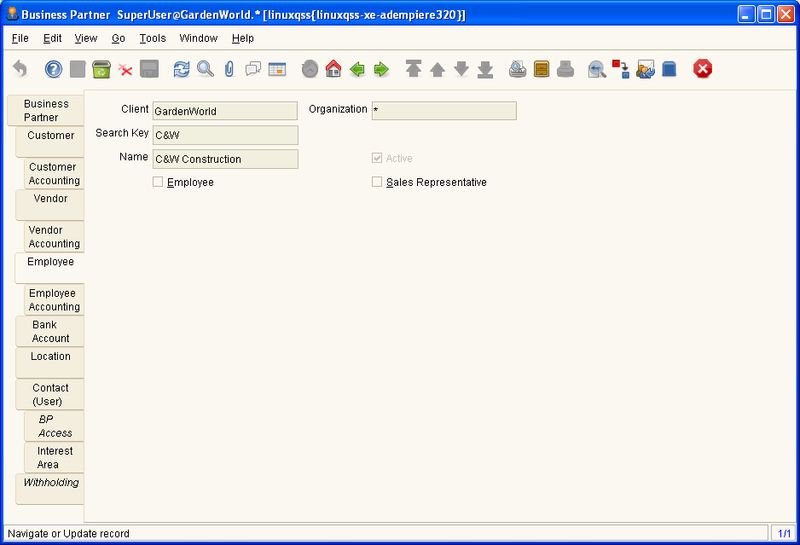 If you select a Role, the access to the new Organization is limited to that role, otherwise all (non manual) roles of the Client will have access to the new Organization. Help : The Customer Tab defines a Business Partner who is a customer of this organization. 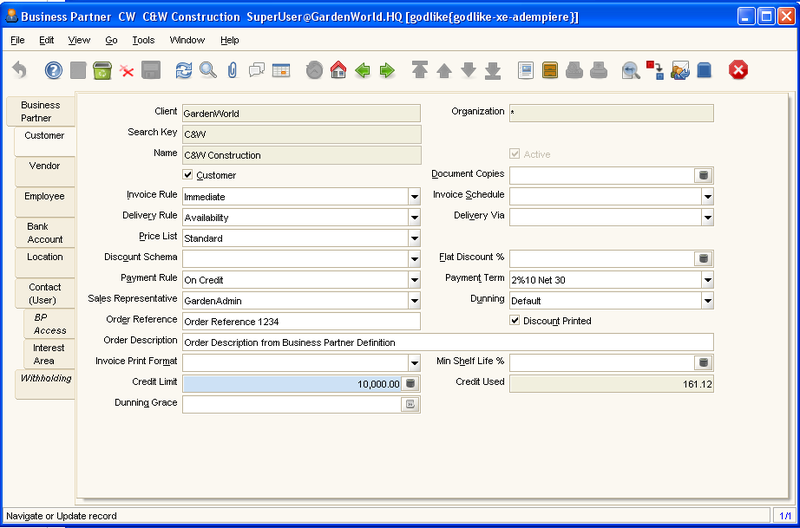 If the Customer check box is selected then the necessary fields will display. Help : The Customer Accounting Tab defines the default accounts to use when this business partner is referenced on an accounts receivable transaction. Help : The Vendor Tab defines a Business Partner that is a Vendor for this Organization. 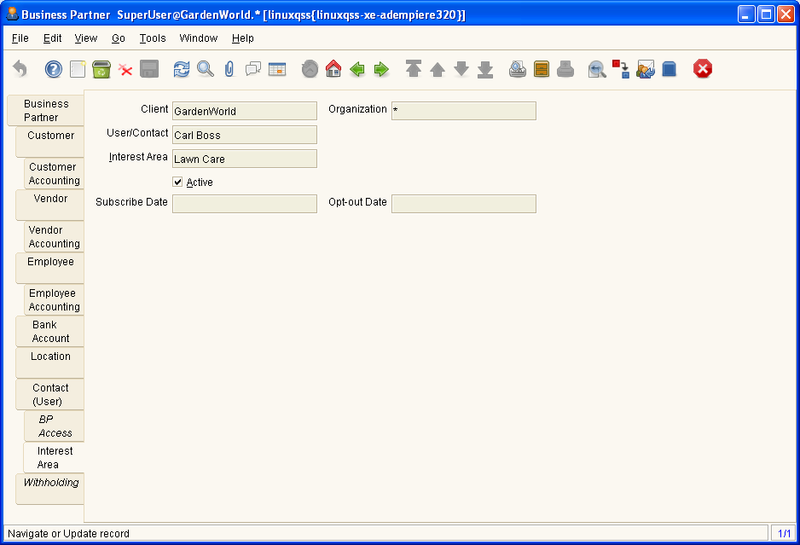 If the Vendor check box is selected the necessary fields will display. Help : The Vendor Accounting Tab defines the default accounts to use when this business partner is referenced in an accounts payable transaction. Help : The Employee Tab defines a Business Partner who is an Employee of this organization. If the Employee is also a Sales Representative then the check box should be selected. Help : The Employee Accounting Tab defines the default accounts to use when this business partner is referenced on a expense reimbursement. Help : The Define Bank Account Tab defines the banking information for this business partner. This data is used for processing payments and remittances. Help : The Location Tab defines the physical location of a business partner. A business partner may have multiple location records. Help : If on User level, "Full BP Access" is NOT selected, you need to give access explicitly here. Help : The Withholding Tab defines any withholding information for this business partner. You will find further information here in the Contributions section, as the above sections are automatically generated. Therefore, any changes there would be lost. The information below should be only additional information to supplement the above. If you find duplications to the above then please edit or raise a note in the Adempiere forum in Sourceforge. To understand the meaning of optional & required as used below, see Optional & Required Definitions for an explanation. This is where you define all your Business Partners (BP), or in other words, all of your employees, clients and vendors. If you had gone through the Business Partner Group, you will already have a base that can be use for each of your new BPs otherwise, you will define the attributes for each one you create here. Note, If you want to reuse the information that you enter here in other organizations under the same client, make sure to select the organization "*" at login or choose "*" in the organization drop down when creating a new record. That will make all settings you create common for all organizations under this client. This will apply to any codes, groupings, etc that you want to appear in many levels of an organization in your company (client). If you elect to create a new BP, then there are certain fields that are required to be defined. You will find that the Client and Organization are defaulted based on the choice you made when you logged in. Creating a new record allows you to change the Client and Organization, however, after saving, these values are fixed. 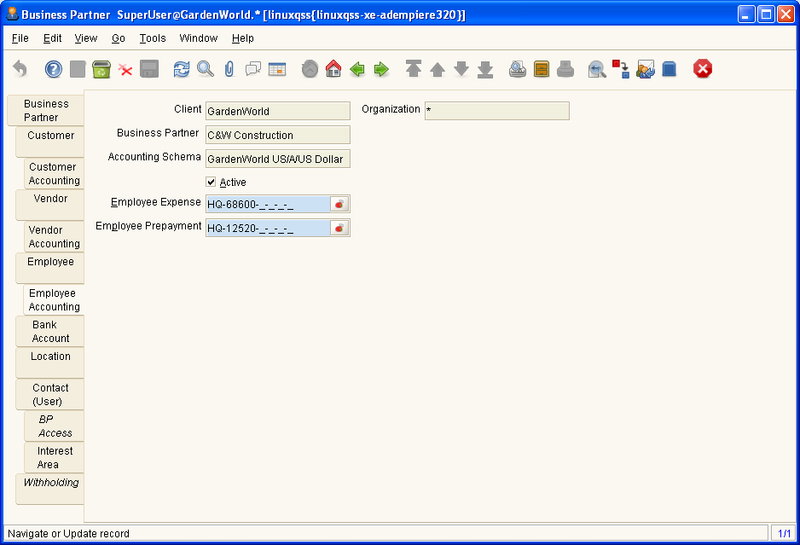 You may choose an organization of "*" as the BP is valid for all organizations in the client. For example, certain vendors, like your phone provider, stationary, etc. Indicate what type of credit rating this BP is. For example, they are OK, need to watch, stop, etc. The status is automatically maintained, unless No Credit Check has been selected. It is used along with Open Balance (the next field) to determine the type of credit status to apply. This field is calculated based on paid & unpaid invoices. If negative, then the client/tenant owes the BP money. This field is used to determine the Credit Status to apply. By choosing the appropriate group you allow some defaults to be used for the BP. It also allows you to report the BP in a specific group and assists to easily identify the type of BP this is. The Employee Accounting tab is required if you have elected to make the BP an employee. You can keep the account structure below as it would have defaulted from the Business Partner Group that was assigned to this BP. Note that this tab still exists even if you have not elected the BP to be an employee. Best not to remove the entry if you have not elected to have the BP as an employee. You never know what is in for the future. Select this tab if you want to define banking details for the business partner. Select this field if you want to process the bank account via ACH. ACH is only available in the USA. Even though the term ACH is for the USA banking transfer system, in Adempiere it provides further fields for entering the actual bank account etc. 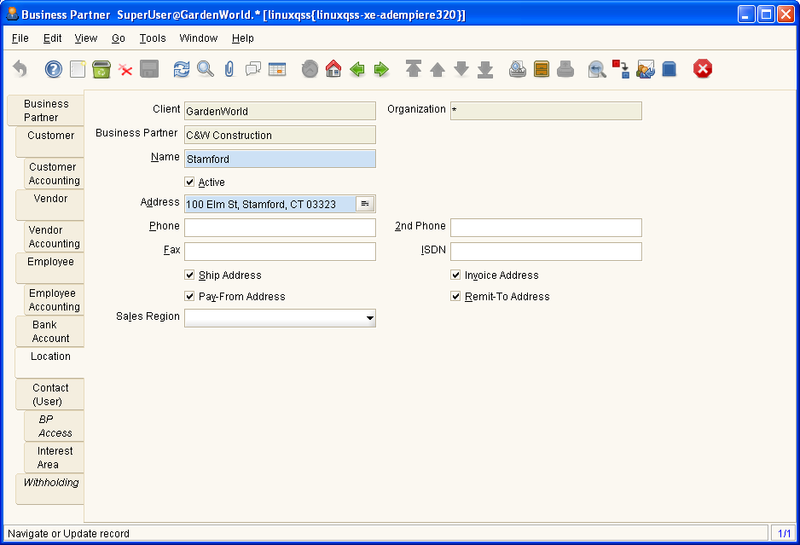 Select this tab if you want to define location details for the business partner. You can have multiple address locations. The tab allows you to nominate whether the location is for shipping, invoicing, pay-from, or remit-to addresses. This field cannot be updated directly. At the end of the field there is an icon and when clicked will produce mini-windows that allows you to enter the address information. 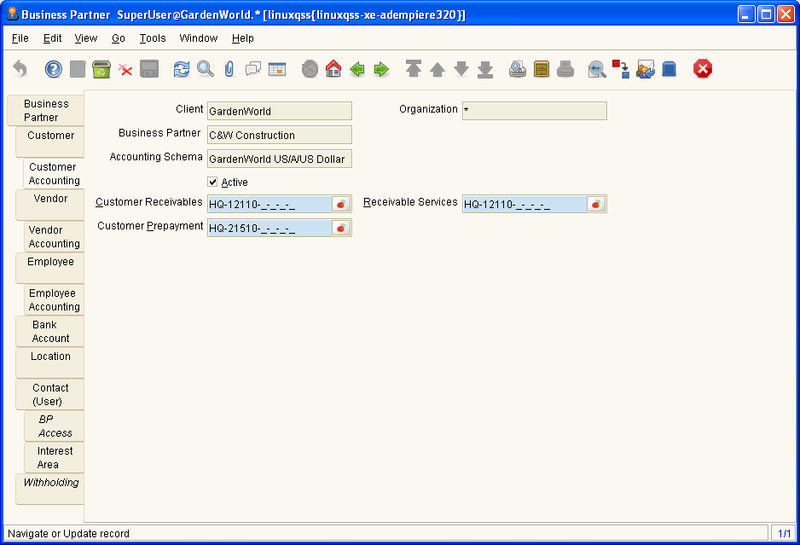 If you want to have a different default for the Country and Region, then look at How to change the default country for the Business Partner Location. Select this tab if you want to define various contacts/users for the business partner. More relevant if the contact/user is an employee. Define the type of position, eg Manager. Which would be used if the employee was an Accounts Manager, Finance Manager, IT Manager, etc. Only required if you want to limit the type of BP access for this contact/user. This tab is to provide access to the BP details via the web store only and not system access. 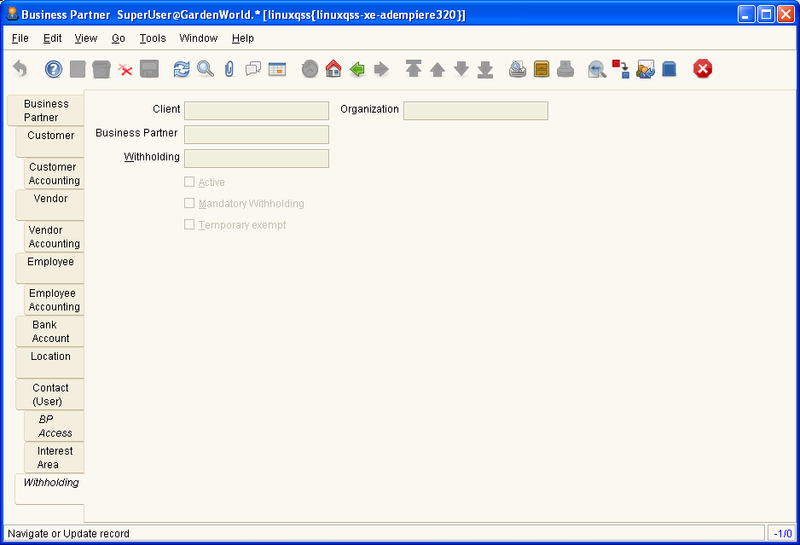 This page was last modified on 20 September 2010, at 13:36. This page has been accessed 24,280 times.